- There's no essential plot or exposition in this episode that renders it unskippable, but it's a decent episode, if a bit slow. - In Nancy's first scene she walks onto the set singing before being startled to see McCoy. While she's singing, you can clearly see that her lips are not moving. - This was the first episode of Star Trek to air on national television. The true pilot, The Cage, was never aired during the show's original run. - Vulcan has no moon according to Spock in this episode. - The "great bird of the galaxy" Sulu referred to in this episode is actually a reference to a nickname given to Gene Roddenberry by the production staff. - This episode establishes that Buffalo on Earth are extinct at this time. 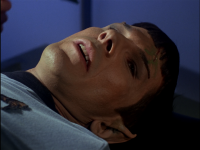 - This is the first episode to depict Vulcans' green blood. - McCoy and Kirk arguing over how young McCoy's old girlfriend looks. - McCoy: "He's dead, Jim." Count 1. 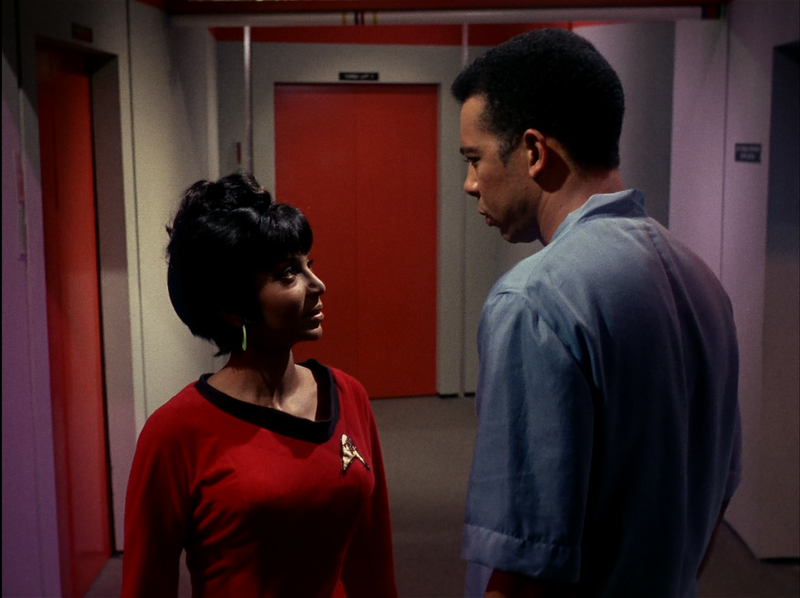 - Uhura toying with Spock. 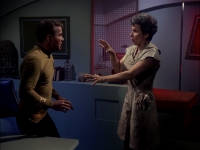 - Kirk yelling at McCoy for changing the subject to his old girlfriend again just after discussing the dead crewman. - McCoy and Kirk needling Crater for information concerning the connection between his desire for salt and the crewman's death. - Sulu: "May the great bird of the galaxy bless your planet." - Kirk and Spock coordinating a stun attack on Crater. - Crater and "McCoy" trying to defend the salt monster's right to live. A considerable time since the events of The Cage, The Man Trap introduces us to a brand new cast and crew of The Enterprise with Mr. Spock being the only recognizable character retained since Captain Pike's days. 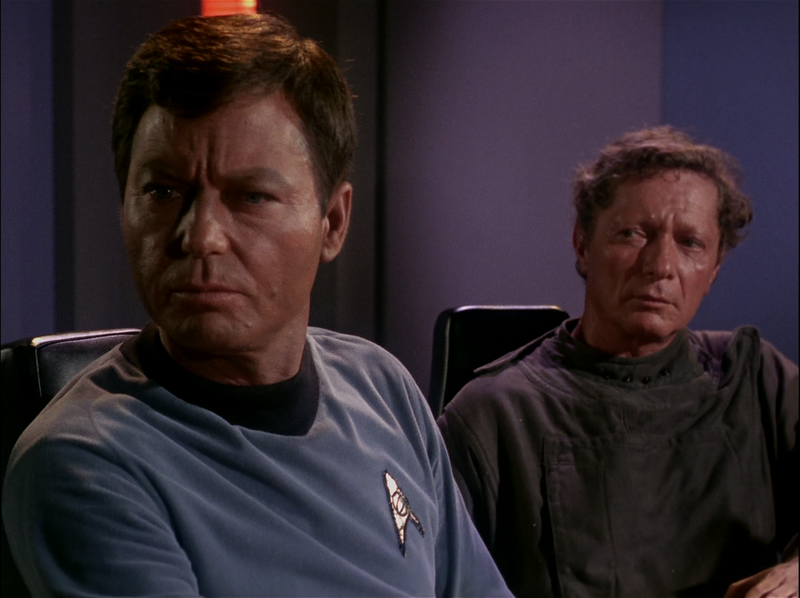 Captain Kirk now commands the Enterprise and Leonard McCoy is now the chief medical officer. Other new and notable characters include communications officer Uhura, ship's pilot Sulu, and yeoman Rand, who all do quite a nice job of rounding out the cast. It's important to note that since The Cage never aired until after Star Trek was canceled, The Man Trap is the first episode of Star Trek that original audiences ever saw. As such, the universe of Star Trek is first introduced here. Much like The Cage, The Man Trap depicts a highly technologically advanced future for Earth where presumably ships like The Enterprise roam the galaxy both exploring new space and resupplying and otherwise assisting Earth's various colonies. As evidenced by Mr. Spock, some aliens even live amongst the humans, however their citizenship status remains unclear. At this point, it's not made clear whether or not Earth exists as a nation or if Earth is just a member state in a much larger nation. Not all aliens are benign, friendly allies like Mr. Spock though, as the salt monster clearly indicates. Framing the salt monster as an endangered species that should be protected was a particularly clever way to enhance what is, frankly, a meager plot. Right from the beginning we know that Nancy is not all she appears to be, and it doesn't take too much longer for her odd preoccupation with salt to become obvious not just to the audience, but to our heroes as well. Because of this, the plot seems to drag on at a painfully slow pace, what with four extras dying and even Crater dying before Kirk figures out what's going on. Despite that though there are certainly some nice touches even beyond the endangered species commentary. I liked Kirk's and Spock's coordinated non-lethal attack on Crater along with the attention to detail concerning Spock's alien anatomy. The salt monster itself, once its true form was revealed at the end of the episode, was an impressive costume as well despite it being simply a guy in a rubber suit. Overall The Man Trap is an effective story, but it could have been better if it had a subplot; especially one that focused more on exposition about Earth, the Enterprise, and the nature of their mission. I rated this episode a 4. The pacing is too slow, especially in the second half of the episode. You feel like your watching it in slow-mo. 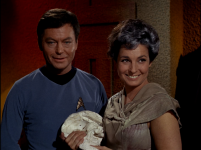 One plus is that the dialog between Kirk and Bones is emotional and passionate. While it's true that this episode is a bit slow, it has to be. Remember this was the one that had to introduce a whole new show, so there was bound to be a bit of an introduction to people, what they could do, where they came from and so on. The mistake here is that the alien is revealed to the viewer within the first... 3 minutes. We then end up waiting for the crew to catch up with what the audience knows. Later episodes worked out how to do this much better. I'm writing this 44 years after the program was first broadcast, and it's still watchable. That can't be a bad start! I just rewatched this episode, and thought it was quite good up until the final confrontation. 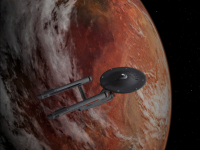 Of course this was the first episode shown, but after watching so many other Star Treks there is something a bit refreshing about this monster. 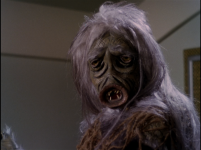 In your typical TNG episode the monster is some unstoppable menace that requires a brilliant plan or new invention to defeat. The salt vampire really isn't so overblown. It never seriously threatens to destroy the Enterprise. It is enough for purposes of the story that a killer is on the loose, and Kirk has to stop it. Monster stories usually involve a lot of foolishness by the crew, but in this case I thought everyone reacted fairly logically, given that they think this is a routine checkup (except for the usual question of why the bridge crew has to do everything for themselves). The first death triggers an immediate investigation. 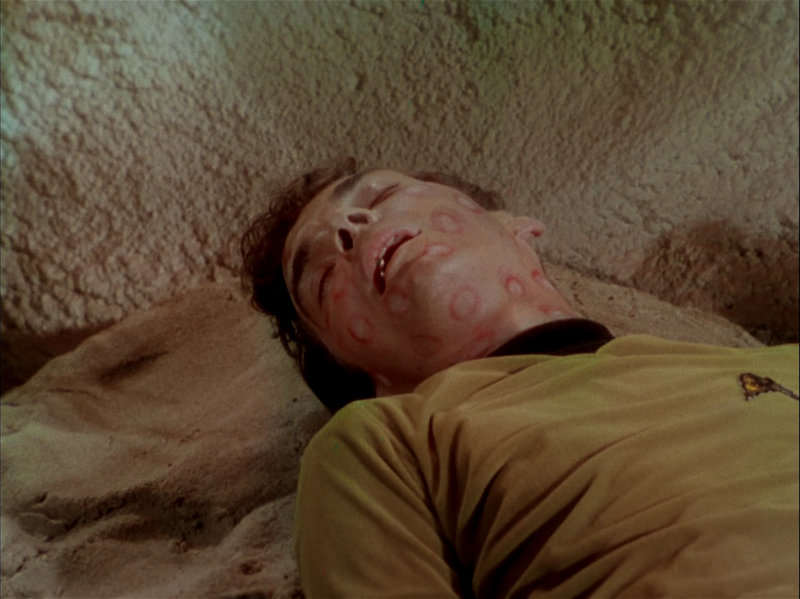 Once Kirk sees the second death, he stops messing around and nobody dies on the planet after that (it just takes them a while to find the third death). Once he finds crewman Green's body, he immediately alerts the ship. The fourth death has basically already happened by this point. The ship goes on security alert, and for once it actually works, no more deaths after this point. Rewatching the episode, I watched the salt vampire's behavior rather carefully, and its behavior is very interesting. It basically relies on its empathic powers to try to fit in, but it is confused and not very intelligent. It just sort of reacts to what is happening and tries to fit in and find salt, but it is basically certain to get caught. It is not a deadly, super-cunning alien menace, but a confused, hungry creature which must be stopped before it kills again. 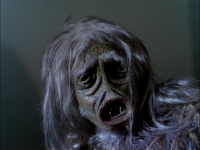 The episode is more interesting too when you try to figure out what the monster is thinking, since the pace certainly is a bit slow. As for the professor's motives – well, he's lost his mind, he's capable of anything. The final confrontation is not so great for me, it seems way overdramatized. 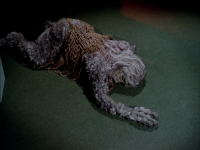 Also, as has been mentioned in other forums, the total lack of any attempt to avoid killing the creature doesn't seem consistent with the idealistic philosophy of later Star Trek episodes. Well, maybe Starfleet regretted the incident and instituted new regulations to prevent it from happening again. 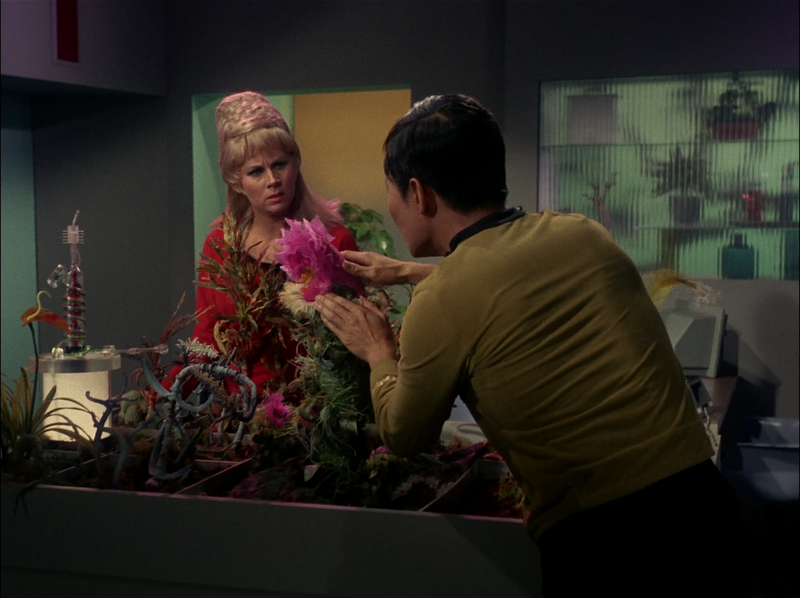 Maybe Kirk was thinking of this incident when he later spared the Horta. 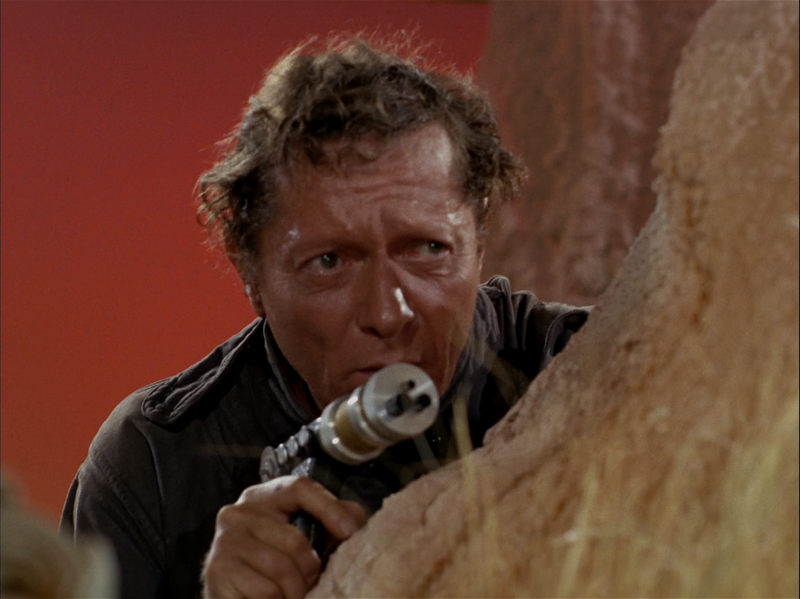 - Kirk makes a log entry about armed men not being caught off guard unless the creature has hypnotic or paralyzing powers. Not only is this inference unwarranted, this is before he realizes that there is a creature at all, rather than some other cause of death (disease, chemicals, radiation, plants, whatever). But he doesn't seem to be making the entry at the time we hear it (we see him searching the planet), so he must have made it afterwards, and his memories were colored by his later knowledge. 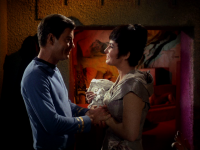 At the beginning (starting at about 47s), Kirk grabs some "flowers" for Nancy. Huh? Those are not flowers. They're more like straw. Guys, try handing these "flowers" to your honey and see what happens! 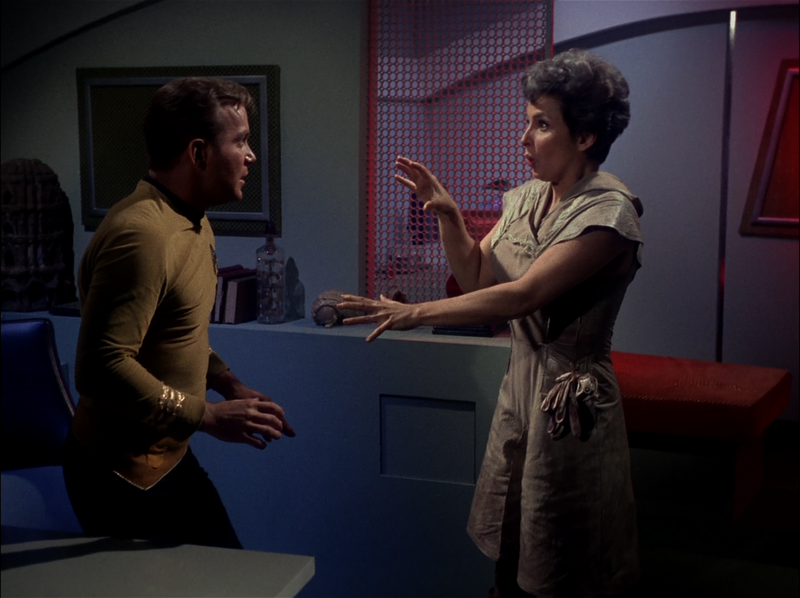 At the end of the episode (in the scene starting at 44m31s), Spock is repeatedly smacking Nancy hard -- full force, even! -- with a swinging two-handed fist right in her face! Is this not remarkable? (Yes, I know. It's "really" the salt monster. Still.) The whole scene from Nancy entering the room as Dr. McCoy to the shot of the dead salt monster on the floor is truly remarkable, I'd say. Very well done. Even the smacking scene above has problems. Watch the salt tablets go flying out of Kirk's hand onto the floor! I wonder if even a single tablet was caught by "Nancy." Still a great scene. Scenes with Yeoman Rand. 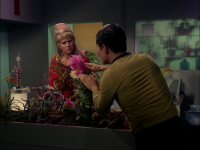 The "flower" in the scene with her, Sulu, and Green is so obviously a hand in a glove it's just ridiculous. It's amazing how Shatner, Nimoy, and Kelly got into character so fast at the beginning of the series. I totally agree with what has been written here about Man Trap. The story could have been stronger. However, I must say that this episode really keeps me interested the whole time. And I think it is because there is a lot of background development of several crew members, which I think is lacking in a lot of episodes. 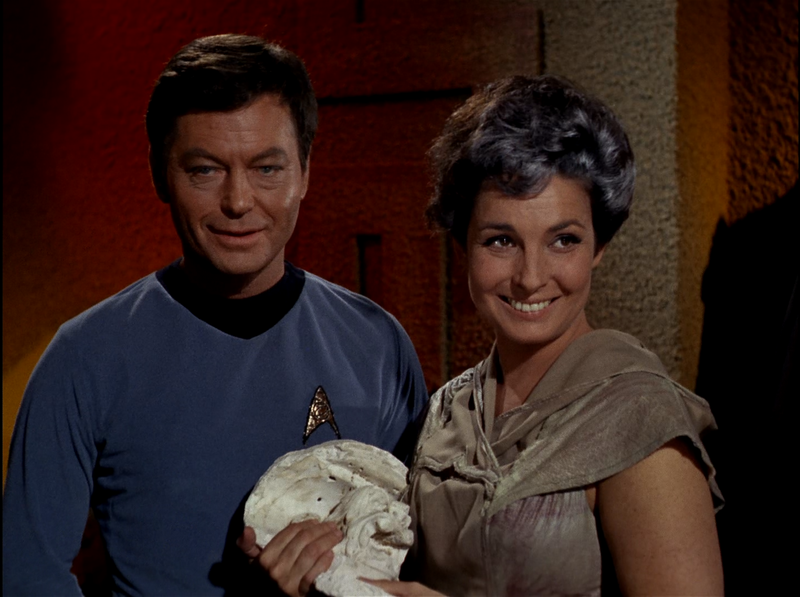 You learn so much about the thoughts and feelings of Dr. McCoy, Sulu, Uhura and Rand. And that is so great. I only wish this kind of thing was developed a lot more with the rest of the crew over the years, but alas it was not. A real shame too because good character makes the story so much more interesting. I guess I understand why they aired this one first, but I wish they hadn't. This should be the 6th episode, not the first. The relationships are much more solidified than you'd expect in the very beginning--and, indeed, more developed than they are in Where No Man Has Gone Before and The Corbomite Maneuver. Airing them out of order makes it seem like they are backtracking in character development and relationships. 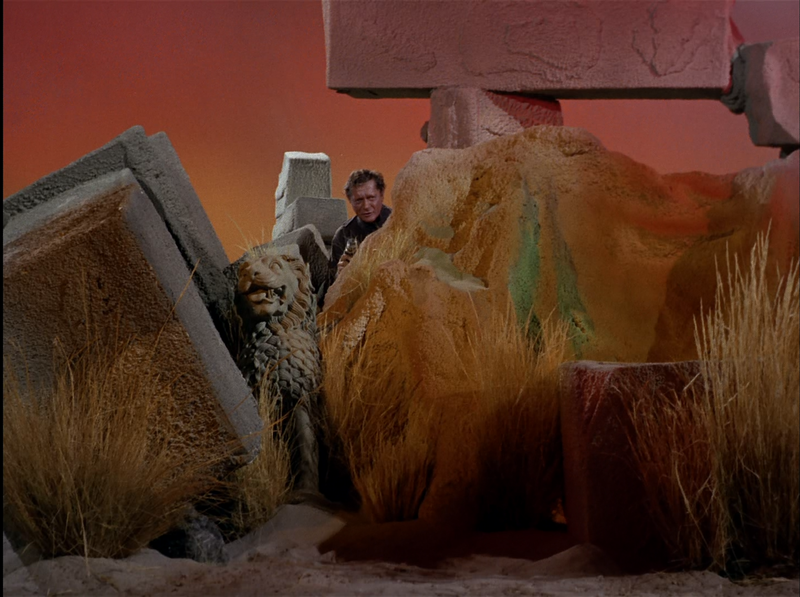 Kirk's opening narration is somewhat subdued. He speaks softly. Transitions of Nancy into others, etc., are mostly well done. Isn't it a bit weird that the transitions of the monster include clothing? How does that work? I agree with Kethinov that the salt monster costume is pretty good. But I think the pace is okay most of the time. I like seeing Kirk and Spock slowly figuring out what's going on as they accumulate clues. 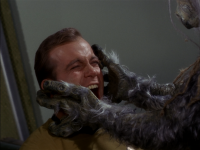 Why does Kirk scream out for Green? Why doesn't he use his communicator? Must be a communicator breakdown. Or maybe Green left his on the ship. When Crater shoots down the pillar at 34:20 I think it looks quite good! Even with the frame frozen you can see the phaser beam strike right at the center of the explosion. It's well timed, too. Well done! But I don't understand why the camera rocks left and right. Regardless, it looks pretty good. 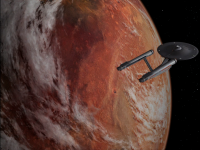 When Spock yells to Crater, Crater looks the wrong way! Spock is on the right and Crater looks to screen left. But the actual shot of him getting stunned is well done. ‘7’. 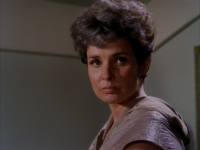 One of the interesting features of this episode is that it shows how quickly Gene Roddenberry’s Star Trek evolved from the concepts in the pilot episode into a more ‘final’ form. Every decision – casting, characters, uniforms, equipment, etc – looks like a step in the right direction to me. The fact that this episode was shown out of order indicates that the network either felt it was a better representation of what the show was to be about, or perhaps wanted a plot an average viewer would connect with for debut. Another bonus is that the Enterprise is not saving the Enterprise or the Earth this time. Well, there will always be plenty of time to do that later in Star Trek, oh about 175 times. 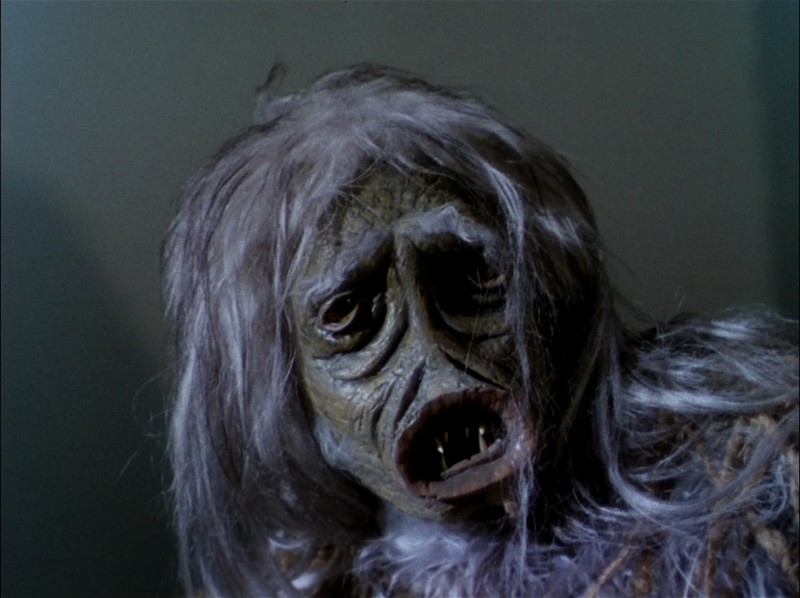 The creature itself, as a shape-shifter that takes on a form pleasing to its victim, resembles a little one of the later Night Stalker episodes - I've always been a sucker for that theme. On the sly, the episode also seems to be a bit of a satirical look at women in relationships or marriage. The Antares is variously referred to as a cargo ship, transport ship, a science probe vessel and a survey ship. That's a problem in the episode, if you ask me. I have always wondered about this episode. Instead of killing the creature, why didn't they just replicate salt?